Rush bassist Geddy Lee has revealed that he has no plans to release new music material in the near future. Lee is currently busy promoting his just-published tribute to his instrument, Geddy Lee’s Big Beautiful Book of Bass. 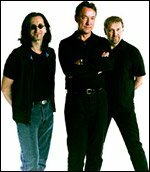 Last year, Rush guitarist Alex Lifeson had said that the band had no plans to tour or record again.